It’s heartening to know that the future of Scottish acting is in safe hands. 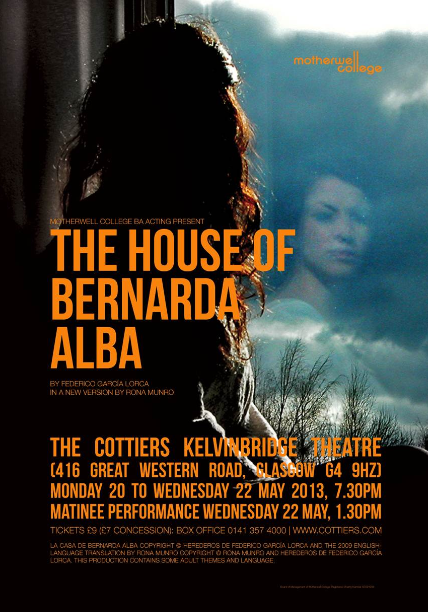 This production of Scottish playwright Rona Munro’s adaptation of Federico Garcia Lorca’s The House of Bernarda Alba is the perfect showcase for the nine young actors in this final performance for Motherwell College’s BA Acting degree. Originally set in Andalusia, Munro’s resetting of the play to the East End of Glasgow has retained Lorca’s central story but added a vividly familiar depiction of the female members of a crime family in the aftermath of a murder. The play ramps up the claustrophobic atmosphere as mother Bernie tightens her stranglehold grip on her daughters as she tries to retain a tenuous hold on both them and her hard-won lifestyle. Munro plays upon the exclusion of male characters from the action: slowly and climatically building up the tension as the women remain trapped together, the feelings of repression, the unrequited passion and displays mental fragility are all acutely displayed. As head of the household Bernie (a role written large by Munro), Dawn Chandler manages to rein in a character who could so easily have descended into parody, to deliver a performance which wrings every drop of venom from every line as the formidable she-wolf slowly consuming her cubs. The interactions of the sisters perfectly reflect the often brutal but ultimately loving relationships that exist between siblings. That said, some are more successful than others: Noemi McShane delivers a nicely nuanced performance as the mentally fragile Marty but her child-like looks render her slightly miscast as the older sister of flighty youngest Adie. As Adie, Christie Brown manages to perfectly convey those particularly annoying “in your face” traits of idealistic teenagers who think they know everything about love and are willing to do anything in its pursuit. Lauren Daley turns in a convincing, naturalistic performance as both the put-upon care-worker and pensioner family friend. Credit must also go to MJ Deans as Bernie’s long-term friend/employee Penny – capturing that West of Scotland former good-time girl teetering on the tightrope wire of a friendship on which her livelihood depends with aplomb. These young women give hope for the future of Scottish theatre and I personally look forward to following their careers with interest.